About a month ago, shortly before the market reached full correction mode, I outlined the problem low-growth dividend stocks would have against rapidly rising Treasury rates – and why it’s vital that we monitor the dividend growth of current and prospective holdings. For one, if interest rates continue to climb, life becomes more difficult for corporations across the board. Per Bloomberg: “Policy accommodation has helped the cost of servicing debt for companies in the S&P 500 fall to an all-time low of 3.5 percent of sales over the past 12 months.” Conversely, rising rates would lead to higher debt-servicing costs, which would naturally weight on profits. The other fear is more targeted at many popular blue chips that yield around 2% to 3% and deliver dividend expansion at a snail’s pace. 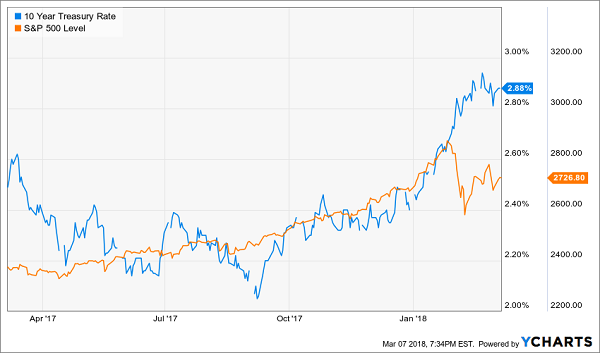 Yes, Coca-Cola (KO) and Merck (MRK) as companies have stood the test of time, but with their stocks flat-lining and their payout growth marginal, the safety of Treasury debt looks increasingly attractive by comparison. That’s why I regularly flag popular yield plays for expected dividend hikes. I want investors to keep an eye on these stocks that they either hold or may be looking at so they can keep track of one of the most important elements of dividend investing. April is particularly thick with longtime payers, so here’s a look at ten stocks that should up the ante next month. Apple (AAPL) typically is under the microscope just because it’s Apple, but investors will be watching particularly closely in April. That’s because the company is expected to deliver a big cash dump on shareholders in the wake of the massive corporate tax cut and repatriation holiday. Per its regular dividend, Apple historically has raised its distribution by about 8% to 15%. The company typically makes the decision public in late April alongside its second-quarter results, though last year that resulted in an early May announcement. American Water Works (AWK) is the nation’s largest publicly traded water and wastewater services company, servicing 15 million people across 47 states and Ontario, Canada. It also has roots going back to 1886 – the year Karl Benz drove the first automobile. In other words, it has seen a few things. And for being a utility company, American Water Works has put up an impressive growth, boasting a doubler in the past five years. Its dividend hasn’t expanded as robustly, but a 48% improvement since 2013 isn’t anything to sneeze at, either. 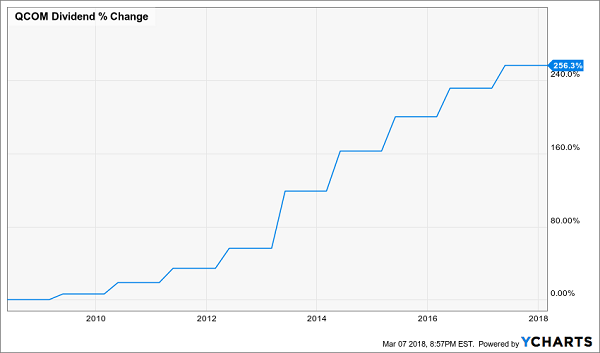 Investors will be looking for AWK to continue its dividend growth streak, which dates back to 2008, sometime during the back half of April, when I typically announces its annual hike. Johnson & Johnson (JNJ) is one of the most notable Dividend Aristocrats in the game. It’s the maker of Johnson’s, Listerine, Neosporine and other consumer brands, but also has robust pharmaceuticals and medical-devices lines. Those have helped power a payout that has grown for 55 consecutive years. Barring a shocker, the company should make it 56 straight years sometime during the final week of April. But how generous it is remains to be seen. JNJ’s dividend growth has been slowly eroding, with its last annual increase a modest 5%. Whirlpool (WHR) is another prolific dividend grower that has more than doubled its payouts over the past half-decade and tacked on a double-digit nudge just last year. Shares themselves, however, have struggled of late. Whirlpool’s stock has been essentially range-bound for about three years as Wall Street tries to figure out exactly what to do with the appliance maker. The company’s past couple of earnings reports haven’t exactly been rosy, and its disappointing Q3 profit reported in November also came alongside news that it would end its roughly century-long partnership with Sears (SHLD) and no longer sell its wares in the struggling retailer’s stores over a pricing dispute. Nonetheless, Whirlpool should be able to scrape together a dividend increase in mid-April when it next reports earnings. Procter & Gamble (PG) is the quintessential consumer staples stock, boasting always-need-‘em products such as Always feminine protection products, Bounty paper towels, Crest toothpaste, Iams pet food and Pampers baby care products. Those are just a few of P&G’s billion-dollar brands – yes, that’s right, each brings in a minimum of $1 billion in annual sales. The company’s roots are deep, going all the way back to 1837. The dividend’s history isn’t much younger; P&G has paid a dividend in each of the past 127 fiscal years, and it has increased its payout for 61 consecutive years. None of that history, unfortunately, acts as salve for shareholders, who are looking at a stock price that isn’t much changed from where it was five years ago. P&G needs to do better by them – and one thing it can do is dole out a better dividend increase than the 3% uptick it delivered last year. The dividend announcement should come sometime mid-month. Almost every headline concerning Qualcomm (QCOM) for the past few months has been tethered to Broadcom’s (AVGO) bid to buy the semiconductor and telecom equipment firm. Just days ago, the Trump administration blocked the potential marriage over national security risks. That bid has helped rejuvenate QCOM shares, which still are sitting on a negative five-year return. But in April, Qualcomm can direct a little focus back to one of its better traits: dividend growth. QCOM has been one of the more impressive payout performers in tech, cranking its dividend from 25 cents per share at the end of 2013 to a current 57 cents – a whopping 128% increase. The company should announce its next boost during the first couple weeks of April. Invesco (IVZ) is an investment management company that’s known for its namesake mutual funds and closed-end funds, as well as exchange-traded funds under the PowerShares brand – the fourth-largest ETF provider. Invesco also bought Guggenheim’s ETF business in September 2017, and it plans to rebrand those as well as its PowerShares funds this year to bring them under the Invesco nameplate. IVZ has been one of the industry’s underperformers over the past few months. On the flipside, it’s also one of the higher-yielding stocks in the financial space, yielding closer to 4% than 3%. That percentage should get a little extra backing during the last few days of April, when it should announce its regular dividend increase. Just don’t expect much; its last hike was less than 4%. Oil prices are up about 20% over the past 52 weeks, but you’d never know it by looking at shares of energy titan Exxon Mobil (XOM). The stock is off 10% versus a 15% gain for the S&P 500, including a bigger drop than the broader market amid February’s widespread plunge. In fact, things have been so rough for Exxon that the company recently unveiled a plan to assuage shareholders – a plan that includes, among other things, a goal of doubling earnings by 2025. Even that wasn’t enough to revive shares, which slumped to two-year lows. There is an upside for new money, which is that one of the blue-chippiest of energy blue chips now trades for less than 16 times future earnings estimates (cheaper than the S&P 500) and a yield above 4%. That’s a level the stock last saw during the late 1990s! Exxon should tack on a little more income, too, sometime in the waning days of April. Any increase will extend its dividend growth streak to 36 years. Speaking of high yields, Southern Company’s (SO) headline number has pushed back above 5% – the loftiest that figure has been since 2010. The venerable Atlanta-based electric utility company has gotten there in the wrong way – share declines, including a 14% slump in the past three months alone. Southern almost certainly will increase its payout for the 18th consecutive year sometime in the middle of April, but it probably won’t be much. The utility already doles out more than three-quarters of next year’s projected earnings out as dividends, so it doesn’t have room for a generous spike. Also of concern is a long-term debt load that has exploded from $21.3 billion at the end of 2013 to $44.5 billion as of just a few months ago. That can be chalked up to a $12 billion deal to buy AGL Resources, as well as cost overruns related to a power plant it’s building in Kemper County, Mississippi. Real estate investment trust Tanger Factory Outlet Centers (SKT) is the premier name in outlet malls, and the highest-yielding stock on this list at a nice, even 6%. But little about how its yield has ballooned to this level is nice. Yes, Tanger has been a fantastic dividend grower, boasting a 52% boost in its payout across the past five years. 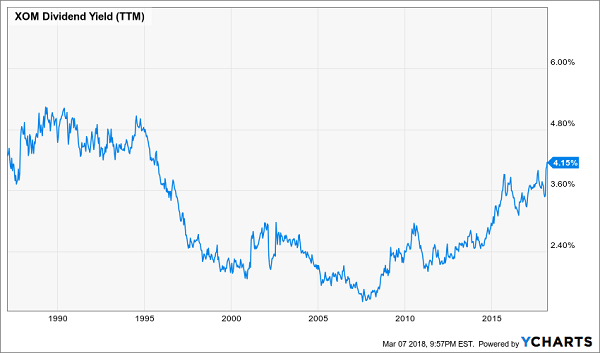 More impressively, it has upped the ante on its dividend for 24 consecutive years, and it’s expected to make it a quarter-century – qualifying it for Dividend Aristocrats inclusion – very early on in April. However, SKT’s yield has gone to nice to outright generous over the past year because of a massive 27% hemorrhaging in shares as it faces a twofold threat of investors fearing the retailpocalypse and a broader interest-rate-sparked selloff among REITs. 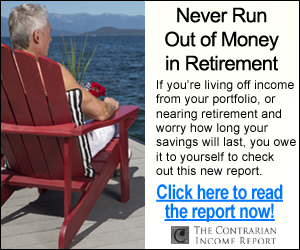 Don’t be fooled by modest current yields. They often don’t capture the growth potential (and it’s the dividend’s and cash flow’s velocity that really makes us big money). Which high velocity dividends should you purchase today? 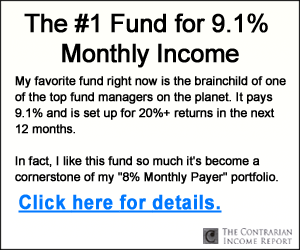 Well you know me – I’ve got three best buys – plus four more bonus dividend growth stocks – that should safely double your money every two or three years. It’s a simple formula – their dividends are doubling often, which means their prices will rise in tandem. At the same time, we’ll collect their dividend payments today and enjoy an even higher income stream tomorrow. This dividend growth strategy has produced amazing 26% annualized returns for my Hidden Yields subscribers since inception. In two-plus years, we’ve crushed the broader market by more than 40%. If you achieve returns of 26%, you’ll double your money in less than three years. So if you haven’t been following this strategy, why not? The best time to get started is right now – before the seven dividend growers I mentioned begin to move. Click here and I’ll share their names, tickers and buy prices with you right now.